Roughly every two years since 2007, Thomas Barlow has published a major analysis of the Australian R&D system with a particular focus on universities. The 2019 edition benchmarks the research performance of Australian universities against that of thousands of other universities worldwide. It also introduces a comprehensive methodology for systematic strategic planning in research. Barlow Report 2019 - Australian University Research on the World Stage uses compelling visualisations and new metrics to benchmark Australian universities' research capabilities against those of thousands of competing institutions in North America, Europe, and Asia. It identifies high-growth and quality-accelerating fields, and highlights high-status universities in other parts of the world that are under-exposed to Australian universities collaborators. It introduces a new framework for drawing institutional comparisons with rigorous methods for quantifying research-teaching alignment and for understanding the extent to which different institutions' research portfolios are focused or diversified. It includes an institutional summary for every Australian university, with data-driven insights on strengths, weaknesses and areas for future focus. Barlow Report 2015 - The State of Research in Australian Universities collates hard data on R&D spending, scale of outputs, and share of citations across 22 ABS fields of research for every Australian university. It also provides an objective analysis of national trends and about the strengths of individual institutions (including CSIRO) across more than 100 ABS research subfields. The report identifies fields where different Australian universities are prioritising investment and building capacity. It provides a framework to help universities and government agencies estimate the likely relative cost required to improve their national standing in any field. It also benchmarks the scale and intensity of Australian university research against other nations, regions, and provinces with comparable population. This is a unique tool for optimising the competitive impact of institutions' research investments. Barlow Repo﻿rt 2011 - Australian Research: Strategies for Turbulent Times used a proprietary model to analyse the distribution of R&D capabilities across Australia, by state and territory, within 12 key capability domains and over 100 fields of research. The report evaluated the dramatic growth in R&D activity in the private sector, describing which fields, industries and regions had been most affected by rising business investment in R&D in Australia, and identifying those fields particularly where there is a clear mismatch between public and private R&D investment. It also highlighted a range of emerging uncertainties for Australian research organisations relating to shifts in the global economy and to changes in the Australian political environment. It offered a series of new and rigorous tools to help Australian research organisations respond strategically to the evidence of mounting uncertainty in the external environment. 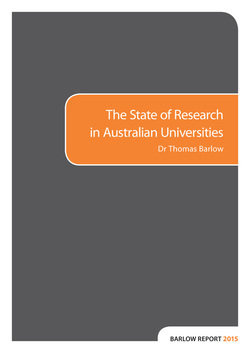 Barlow Report 2009 - The State of Research in Australian Universities provided objective information about the strengths and weaknesses of individual Australian universities and about the risks and rewards for institutions seeking to specialise their research portfolios. It evaluated the extent to which Australian universities cross-subsidised research from teaching revenues, provided evidence about the impacts of state government investments in university research, contrasted institutions' R&D investments per field with their success in national competitive grants, and appraised the impact of medical research upon institutions' potential for growth. The report analysed the performance of Australian universities in international rankings and contrasted Australian and US cities' per capita investments in university research. It also analysed labour markets for PhD graduates and the research productivity of university systems across the OECD. Barlow Report 2007 - The State of Research in Australian Universities was our first assessment of Australian university research. It provided national and international comparisons of publication outputs and research expenditure. It evaluated expenditures and the distribution of government and business research investments by state. The bulk of the report was focused on sharing individual university R&D expenditures by ABS RFCD codes (the precursor to ABS FOR codes). It also included basic commentary on the strategic implications of different institutions' research capabilities in specific fields.